The future success of any organization – whether it is a large holding company, a subsidiary, a start-up, or a public body – depends on how it is able to perceive change and how it adjusts to new challenges. Strategy thus is an important and continuous process. The Strategy panel at Delphique, the National Management Convention of MDI, Gurgaon aims to do research study for strategic problems faced by industry and come up with possible solutions. 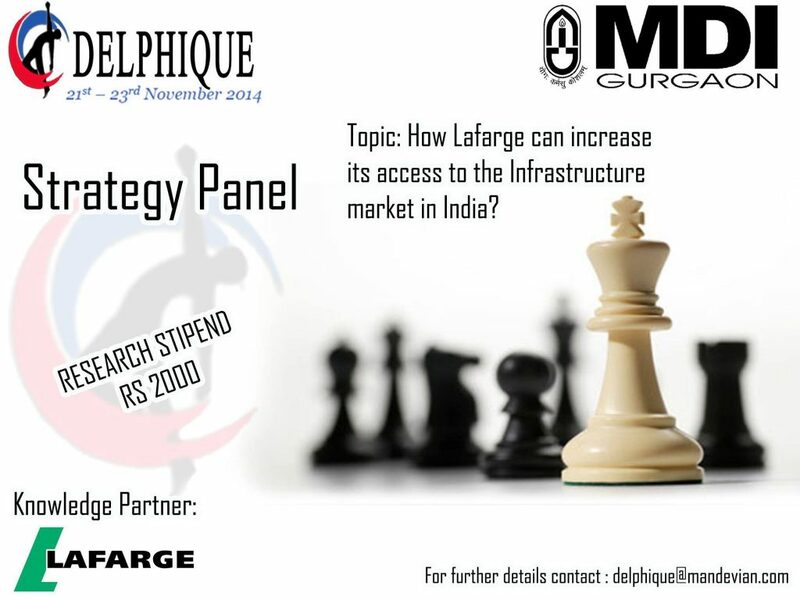 This year Delphique has partnered with Lafarge for Strategy Panel discussion. The research topic is “How Lafarge can increase its access to the Infrastructure market in India?” The Infrastructure projects can be classified in three segments as below, transportation, industrial and real estate. For each segment, the students shall prepare a database of on-going and upcoming projects, covering details e.g. owner, investment, status, contractor firm etc. Subsequently for each segment, the research team will cover the leading players and how they are procuring concrete. Finally, the decision criteria shall be analysed and Lafarge would be given a solution on how to approach these players. Mr.Mohit Kapoor, MD, Projects Business at Lafarge shall be mentoring the students throughout the research. It is a huge opportunity fir students to associate with Lafarge under the guidance of an esteemed and experienced industry mentor. About Lafarge: Lafarge is a EUR 16 billion company headquartered in Paris, France. It deals in cement, aggregates and concrete. Lafarge and Holcim have recently announced a merger that is expected to be complete by mid 2015 to have a combined sales of EUR 34 billion. The second largest cement producer in the world entered into India in 1999 with the acquisition of Tata Steel’s cement assets. The company operates through four plants with a capacity of 11 million tonnes in India. It is focused currently in central and eastern parts of the country.